It was the October of the year 2000. 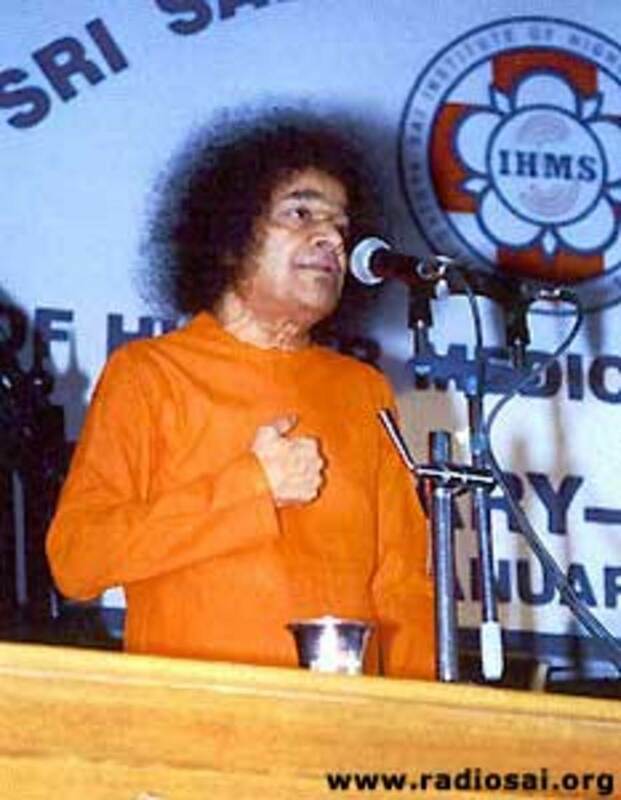 The place which witnessed the story tha am about to describe is the bhajan hall at Prasanthi Nilayam, Puttaparthi. But this was a rare occasion when Swami had glanced through the newspaper and had made an unshakeable resolve! This was the genesis of the magnificent Sri Sathya Sai Grama Seva! Today, this has become part of the annual calendar in the Sri Sathya Sai Institute of Higher Learning and students visit about 160 villages every year, supplying food, clothes and stationery. At a subtler level, the villagers receive hope and love that they are cared for. At the subtlest level, every student gets to see first-hand the conditions in Indian villages. This leaves an inexhaustible craving for service in the heart. The campus of the Sri Sathya Sai Institute of Higher Medical Sciences, Bangalore was abuzz with excitement and activity. It was the first year anniversary and Swami was gracing the grand function that had been organised. The opening ceremony of the hospital had, in fact, been a grander affair. Among the various VIPs attending the opening programme was the chief-guest, the then Prime Minister of India, Sri Atal Behari Vajpayee. In one year of existence itself, the hospital had become a shining example of how medicare should be administered and Swami’s arrival to bless the function was the greatest gift the staff ever dreamed of. Today, for the first anniversary, the Chief Minister of Karnataka, Sri. S.M.Krishna was the chief guest. Also present was the future president of India, Dr.A.P.J.Abdul Kalam. Just for the completeness of the episode, let me also state that it was the 19th of January, 2002. There was a grand welcome for the chief guest and Swami. The area under the magnificent central dome of the hospital had been decked like a bride ready to receive her master. Swami lit the lamp and the ceremony began with Veda chanting. Everyone, including the Chief Minister, expressed their great sense of admiration and gratitude to Swami and the hospital. 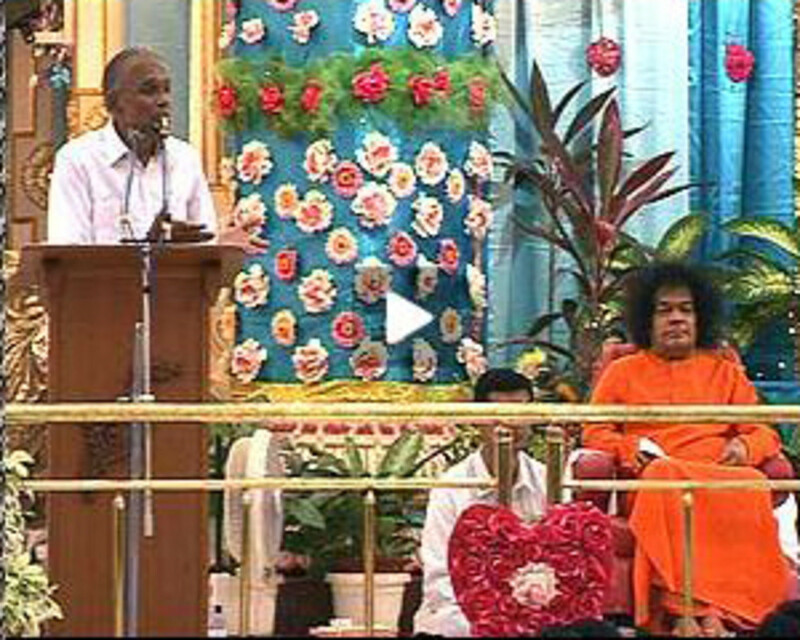 Swami then rose to speak. A small but relevant detour here. This was the time when the metropolitan city of Chennai (formerly Madras) was facing an acute shortage of water. Even drinking water had become a great trouble and people were facing severe hardships ranging from waking up at 2am or 3am to collect water or walking miles and standing in long queues to fill up their urns and pots. This had been reported in the newspapers and, once again, Swami’s eyes had fallen on the news items. 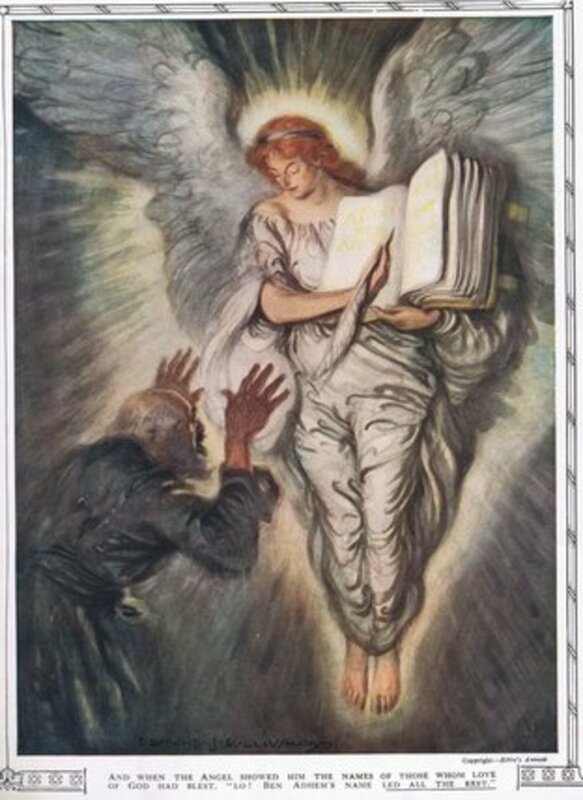 It was another time when He had seen the newspapers. The reason why it struck me is because what followed next was simply stunning. It is always said that the hallmark of a great person is perfect unity in thought, word and deed. 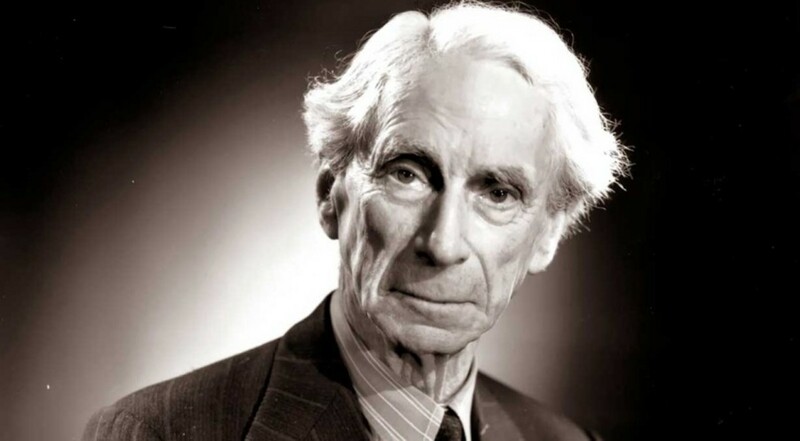 His ‘thought’ of having a strong will to take up sacred tasks had just manifest in His discourse. The next step was to action it. As the first step of an action plan came a declaration out of the blue. It stunned everyone present, including the key members of the trust because they were not aware of any such thing! 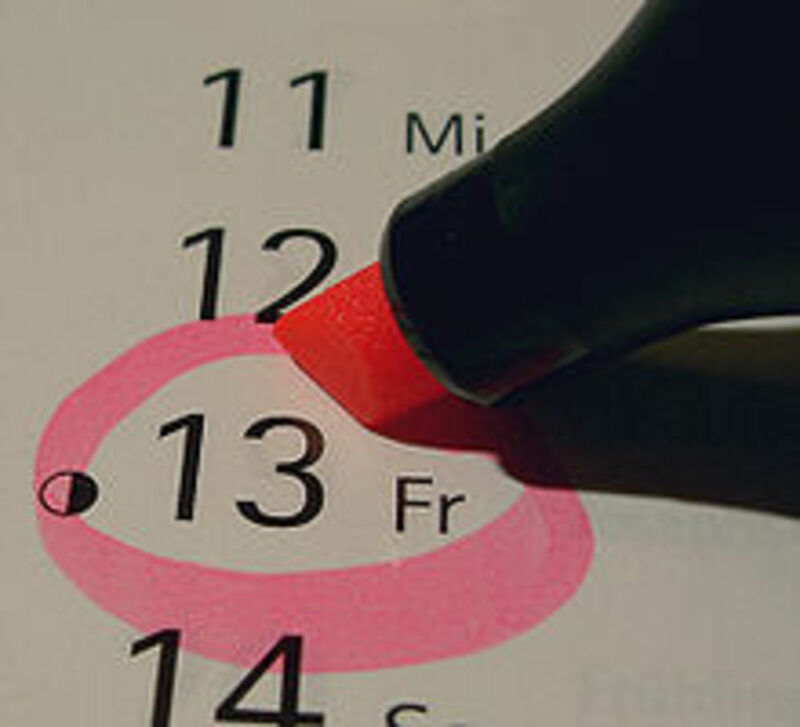 We now fast-forward a few year to arrive at the third week of September 2008. A severe depression in the Bay of Bengal had led to heavy rains & floods in the coastal regions of Orissa state in India. The embankments along the major rivers Mahanadi, Brahmani and Baitarani were breached in many places. This had resulted in the flooding of more than 6,000 villages in 18 districts of the state leaving about 40 lakh (4 million) people hapless and homeless. The districts of Kendrapara, Puri, Jagatsinghpur and Cuttack were the worst affected. Relief work was slow and inadequate due to the continuous inclement weather and insufficient infrastructure. This tremendous human tragedy was splashed all across the newspapers and, yet again, Swami saw the reports. What the papers had conveniently left out was the massive service operations that the volunteers of the Sri Sathya Sai Seva Dal had plunged into, in an attempt to provide some relief to those affected. It was on 7th October, the sacred day of Ayudha Pooja during the Dasara festival at Prasanthi Nilayam that everyone came to know of Bhagawan’s divine will. The Grama Seva about which it has been mentioned in the first episode was on in full swing. All the students were deriving great joy and profound lessons from the service. TheVedapurusha Saptaha Jnana Yagna was on in the Poornachandra auditorium. And every evening, in the Kulwant hall, there were erudite talks and a divine discourse. 7th of October was the day when the All-India President of the Sathya Sai Organizations, Mr.V.Srinivasan, was delivering his speech. “Seven districts of Orissa are totally inundated. Hundreds of villages are completely destroyed. Bhagavan’s heart has gone out to them. Everyday He is in pain thinking about them. And now Bhagavan has decided that immediately a sum of 10 crore rupees (US $2 million) will be given to the state of Orissa for construction of new houses for those who have lost them. These houses that will be built for the marooned villagers, will not be temporary; they will be strong and sturdy concrete structures which would be permanent. Also, it would not only be homes, it would be supplemented with schools and other necessities. 1. Sri Sathya Sai Mobile Hospital - a moving miracle of Love. And if you want to subscribe to such articles, please "subscribe" to public updates on my Facebook profile or just "like" this Facebook page. Or you could follow these articles on Google+. My other blog is at aravindb1982.blogspot.in. 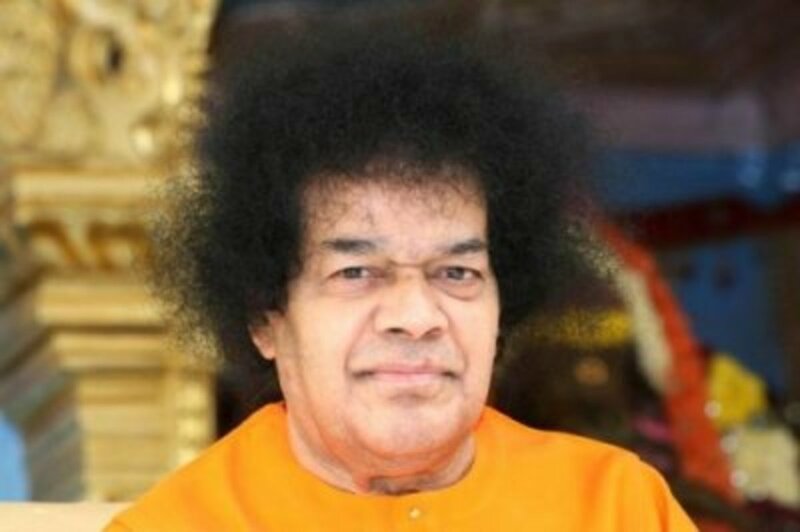 I know some of Swami's closer staff used to cut upsetting stories out of the newspapers if he ever asked to see the papers, because they did not want him to be upset of the stories! With all the negative things going on in the world today, it always makes me feel better to read about people who make a positive impact. Thanks for this hub. The Odisha (name has changed since 2011) Project was covered extensively by local media. 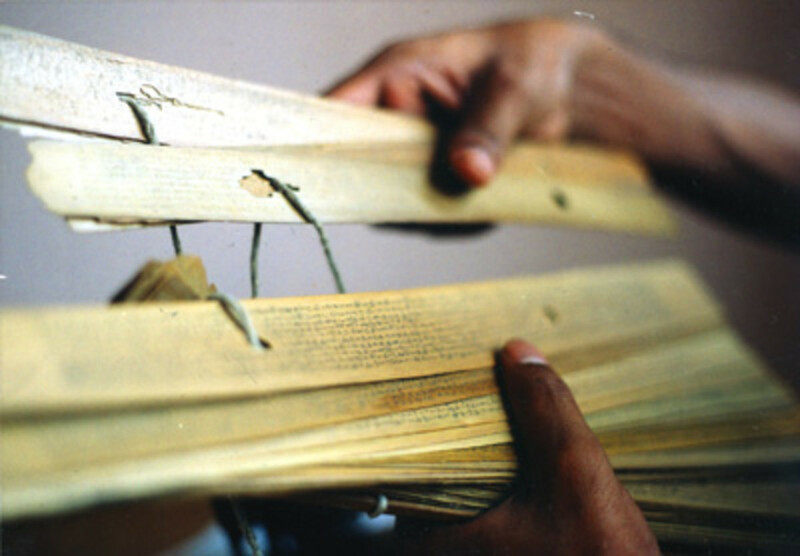 Newspapers like Samaj, Sambad, Dharitri (all Odia reputed newspapers) gave a substantial column to the Trust's activities. Nevertheless you are right, for the national print and electronic media was silent. They survive with gossip, while Baba's philosophy is action ! :-) Poles apart indeed ! The write up is very inspiring.It touched my heart.It's our duty to follow the teachings of Our beloved Bhagavan and put in to practice. I totally agree with Aarthi ..
Threadbare spirituality is tough for most people to take (including me) .. You give it in such a beautiful form that is digestible and so enjoyable too!! The service that you are rendering is at a very subtle level that has far reaching effects than you can ever imagine.. Your writing is transforming so many of us ..
And I think Swami has endowed each person with different talents with good reason.. So that each can serve in a certain capacity.. Master planner that he is, he would have ensured that the full picture is a wholesome one.. Some doing physical work and directly touching the people in need and making the world a better place, some taking care to inculcate values in the generation to come and so on.. He would have ensured each and every bit of his mission is taken care of.. Each of us are just like the squirrel that rendered service to Rama in its own small way .. I think we will be doing a great job if we keep at whatever we are doing and consistently give it our best shot .. Thanks you for sharing such a beautiful episode.. I cannot imagine the plight of the old grandparents if not for Swami's timely attention.. I forgot to mention: I love the white dress code the studens are wearing in the second photo You have posted. Pure. Swami not only has inspired but also guides us to the needy. There is a similar story like that of the one in episode -1 . A family of five children in the age 15 to 2 years lost both mother and father and were living with aged grandparents in a house that was almost collapsing from the roof. We have a group of energetic seva team which is much focused beyond words. The house was revamped from roof to floor and toilet to garden. The team visits them often and support them with grocery while another region supports them with paying electricity bills and the children are attending school. The happiness and relief of the old grand parents cannot be explained in words. 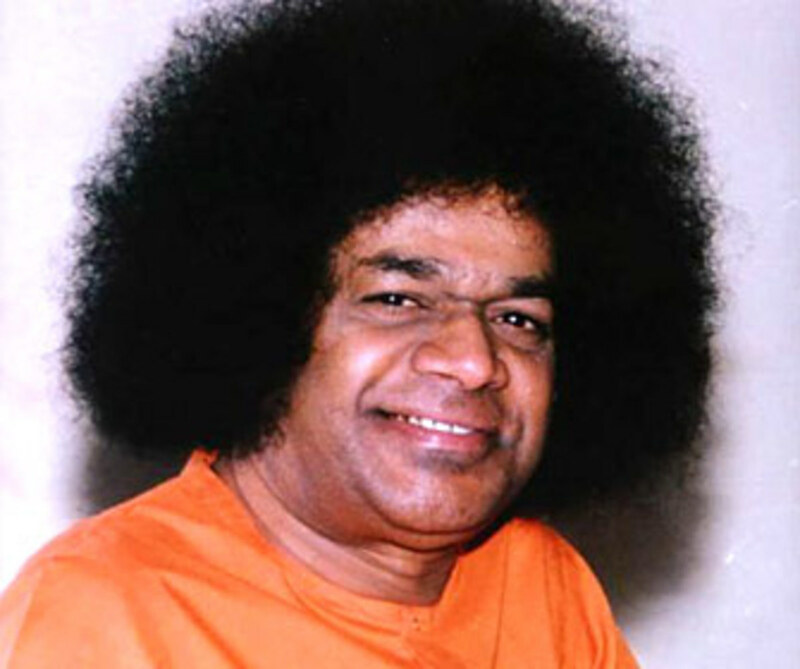 It was Swami who identified the family that was badly in need of help. Second episode is closer to me in the sense that I am from Chennai and I know about the dryness we had. Monsoon failed for 5 years or so. Swami showered his love ! Regarding publicity I would like to share an observation .... About 2 weeks ago Sri and I had visited a home affected with HIV/AIDS. Another organisation that helps them with grocery has placed their Swamiji's picture in that home. We as part of Sai organization have done seva in various places, but no publicity was done. The team quietly would do incredible work! 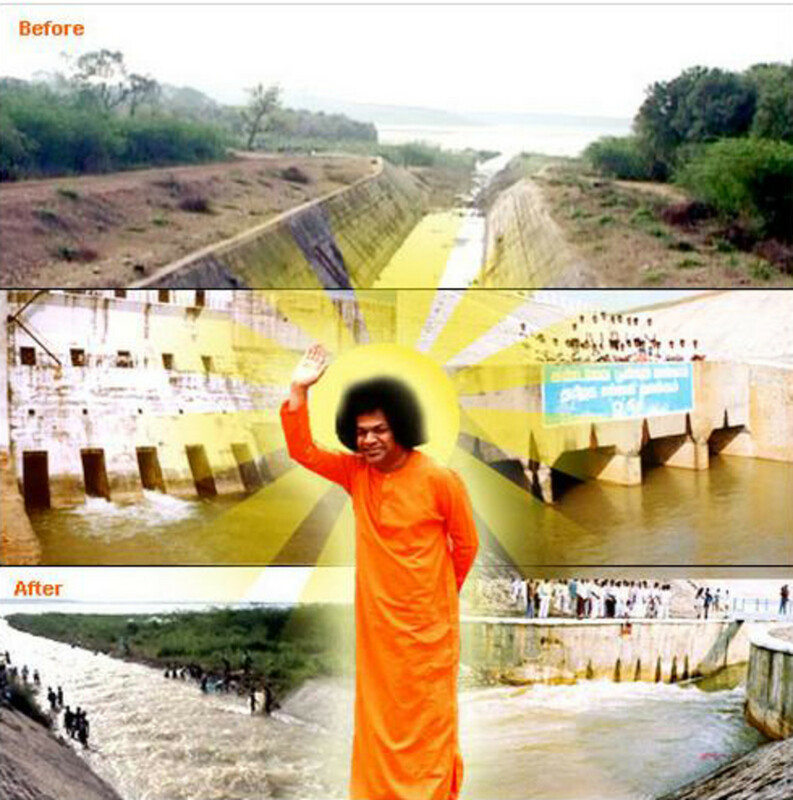 Swami's seva will inspire millions in the years to come thus paving way for golden age!!! "Swami exhorted everyone to strive for unity" - It is so simple, yet so difficult for so many people to understand ... It boggles my mind. Well, at least some people are trying to help-out. That I appreciate. And I appreciate You raising awareness on such issues as well, Mr. Aravind. Many of us here did not know the background of all these gigantic projects. this article is an eye-opener to what led to all these service activities. Swamy's heart is full of compassion and Love. Truly very inspiring. Sairam Aravind !! Another inspired article from you. I heard about this Seva and went into their website to see more details. Your article about said, the students distribute the student necessities like pencils, pens, note books etc. I would like to know more about this but couldn't find it on their website. Is there any other place i can get more information on the items they distribute through this seva so i would like to donate those items? I know they collect hygenic kits for pregnant ladies(i have distributed them previously) and i read from your article and the website that they also distribute sarees. Can we buy sarees and donate them to the Grama Seva people ? how does this works and could you please share information on this ? Sairam. Every person has a unique way of spreading Swami's msg. Some probably do seva at the highest level by reaching out to the needy, some do seva by just being at home and taking care of all the needs of ppl at home, some work in Swami's institutes, and so on -- thr r multiple ways to serve Swami, only thing we have to rem'ber to dedicate the fruits of our actions to Him. That way, I think it becomes easier and we become perfect instruments in His hand. What do you think? This article was part in guilt too. Can I get inspired to do some seva at least in the manner that Swami did? And if I have to get inspired, I have to dive into it right? I felt that I must write (at least) more about this so that am in that 'seva mode'. reading this article switches on current of inspiration and devotion in heart. Very moving write up ..
Swami not only makes plans of mammoth proportions but also executes them with an eye for the minutest of details and a lot of forethought over the future . Maybe that's why it is said that he is 'Anoraneeyana Mahatho maheeyna' ..
Am saddened to think that these are not being publicised .. Yes, Swami does not care for it and neither do we .. But the media is willfully denying a great and inspiring example to the people .. Am sure many would have joined hands to help out in these projects had they been publicised .. And in the process of helping the needy, their own lives would have got transformed and blessed with a clarity over the purpose for life .. How many lives could have been sanctified .. It is so sad that we live in an age where there are multiple powerful and influential forces that are intent to drag mankind down to the depths .. I salute you for writing this brother .. Truly inspiring ..